Grimaldi’s Pizzeria at Toyota Music Factory in Irving, Texas is located on the corner of Las Colinas Blvd. and Fuller Drive. 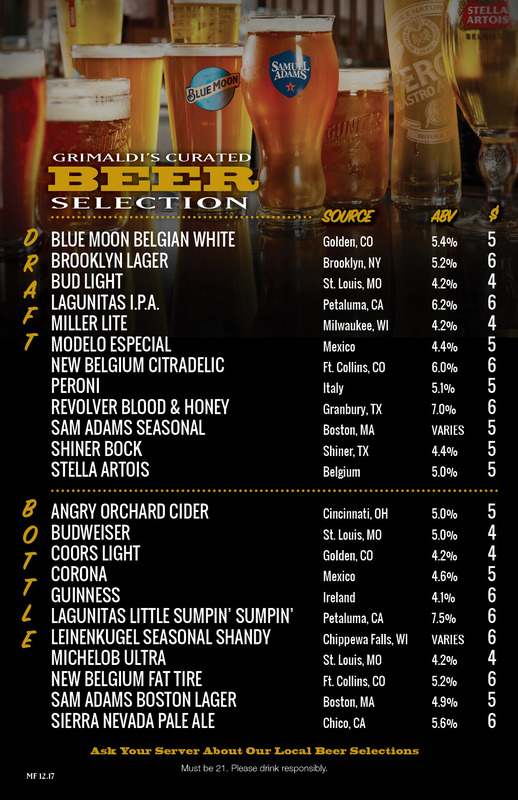 In addition to our world famous pizzas and calzones, we offer 12 draft beers, 11 bottle beers, and 46 hand-selected wines from around the globe. Our ample patio seating accommodates 50 guests comfortably and we also feature both indoor and outdoor bar seating. We can seat up to 100+ guests in our dining room. Centrally located in Las Colinas, we are surrounded by the Irving Convention Center, The Pavilion at Toyota Music Factory and Texas Lottery Plaza. Find our convenient location by exiting Las Colinas Blvd off of TX 114. A four-level parking garage is located directly behind our restaurant and is easily accessible. Come out for great coal-fired pizza and music in one of the most prestigious areas of Irving.